Series artist Guido Guidi was born for this kind of work. When it comes to the Transformers, there have historically been two kinds of artists: those who get it and those who don't – and sadly, the latter have far outnumbered the former. Granted, the task of illustrating an entire race of boxy, metal-skinned, living, breathing robots (no two of which look even remotely alike) is not an easy one… especially when so many different interpretations have come and gone over the years. But I've found that the very best renditions have been able to convey the unique qualities of the Cybertronians' physical features while also delivering a strong sense of identity and humanity to the mix. Guidi is able to bring all of that to the table, while also adding a detail-rich series of backdrops to the list. His work is painstakingly detailed, but not exceptionally busy. Its look and feel is clearly manga-influenced, a carryover from the visual style of 1986's animated Transformers: The Movie, and bursting at the seams with liveliness. Each page of this issue leaps right off the page, which makes actually reading it a delight. This is what I've been looking for out of this property since it was officially relaunched: it's clearly crafted by a longtime fan, and he's poured his heart and soul into his work. While this property was having its issues a few years ago, floating around with little direction at Dreamwave, its shift to IDW has been rejuvenating. The storytelling has taken a step up, returning the franchise to familiar, celebrated themes, and if this issue is any indication, the artwork has never been better. 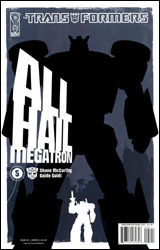 All Hail Megatron was created by the fans, for the fans, and that's a welcome change. Buy it for the artwork alone: the story's just gravy.